Paradise Cottage Cookies in chocolate chip flavour are the perfect biscuits for when you have a crowd over for morning tea. They have a good taste and are perfect with tea and coffee. If you like crunchy cookies, look no further. These cookies are also great value in terms of price. It may not be the top of the line cookies when it comes to gourmet cookies but it works as your to eliminate your busting sugar craving hunger pangs. It also goes great with tea and coffee and perfect for dipping due to it’s crunchiness. Paradise Cottage chocolate chip are a good cookie with a good price,not top of the market but still lovely with a cup of coffee or tea. I like these choc chip cookies because they arent really crumby like others. Good size and great flavour with decent chocolate chips. These had an ok taste but not a lot of crunch. They almost tasted a bit old and the chocolate was few and far between so the kids were not very impressed. These really are an average cookie. Nothing about them stands out. The chocolate is not very strong (flavour), maybe because there aren’t as many choc chips as other cookies. Also the biscuit itself quite average. My daughter and I love these cookies! Its not too sweet and is not bad too bad on our health! You would definitely find these in my pantry and in her lunch box occasionally! 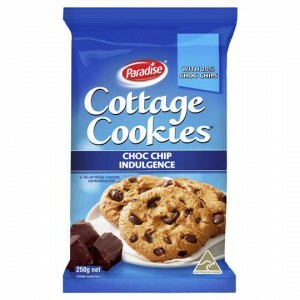 Paradise’s choc chip cottage cookies are great value and good biscuit. I can’t really fault them, the whole family enjoys them, and they do offer value for money. How would you rate Paradise Cottage Cookies Chocolate Chip?